I must have fallen afoul of the literati since I've never heard of these two. Leon Wieseltier is a liberal writer, formerly the literary editor of The New Republic from 1983 to 2014. Jonah Goldberg is a conservative columnist for The National Review, writing about politics and culture. These two are an unusually political choice to be invited onto TCM's guest programmer series, especially less than a month before the most heated presidential campaign in decades draws to a close. Thanks Barton. But they are both Jewish, if that means anything to folks. So culturally they may have a few things in common, despite being polar opposites politically. I think this is going to be one of the more interesting Guest Programmer editions. 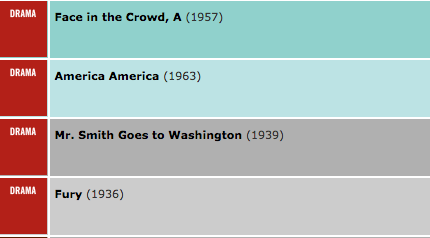 And I hope TCM has other ones with two people selecting films together. It makes the discussion more lively. Originally published in the March 1, 2015 edition of The New York Times, it's an article praising Turner Classic Movies and written by Leon Wieseltier, one half of TCM's guest programmer duo this October.